DAMs (Digital Asset Management systems) are pretty established these days. Once your company gets over 100 in headcount, the need to control you assets between yourself internally and with partners externally starts to become a strong need. Even more so if you’re a remote or distributed company. There are some clear problems with DAMs though. They’re usually large and cumbersome. They have features you don’t really need. Their pricing is opaque. They’re sold as enterprise and at huge cost. They’re bespoke yet weirdly inflexible. They don’t really iterate like a Saas, nor are they as accessible or as easy to use as a Saas. Enter Workshake. Workshake is a Saas approach to DAM technology with a focus on user experience rather than technical need. If a DAM is usually a badly skinned database built by backend engineers, Workshake is a careful crafted and intuitive product based around what people need. DAM is a market that is growing quickly. As cloud storage solutions become lower cost and higher value per GB, there has been a significant growth the the cloud services market which is scaling to support it. There’s also another reason for that. As companies increase their global distribution and remote enable workforce, the need to provide colloid solutions and cloud access to employees increases exponentially. Workshake allows businesses to consolidate all their Cloud storage solutions into one space, and use powerful search tools and meta data passporting to be able to quickly find, share and categorise their assets. Their assets exist within a solid AES 256 encrypted environment which only they can access - and control access to - through user IDs. On synchronisation with Workshake, assets from wherever they may come from are analysed and applied meta data through a lightweight Wolfram engine that looks for format, file structure, image type, colour, existing meta, location and GPS tags, making or versioning formats and basic semantics. Workshake operates like an inbox for your assets. Add assets or asset sources, view, browse and search existing cloud services and simply share with integrated platforms or the product’s secure external portal. Here a distributed team want to share - in this case - a World file amongst themselves. Workshake allows for groups to be created quickly and simply, and for files to be made private, team enabled or all-team enabled though basic, easy to use statuses. Here a team want to share a file externally with a client or partner and wish to do so through a secure and trustworthy portal. Here an agency has uploaded some imagery - both photo-based and graphic. 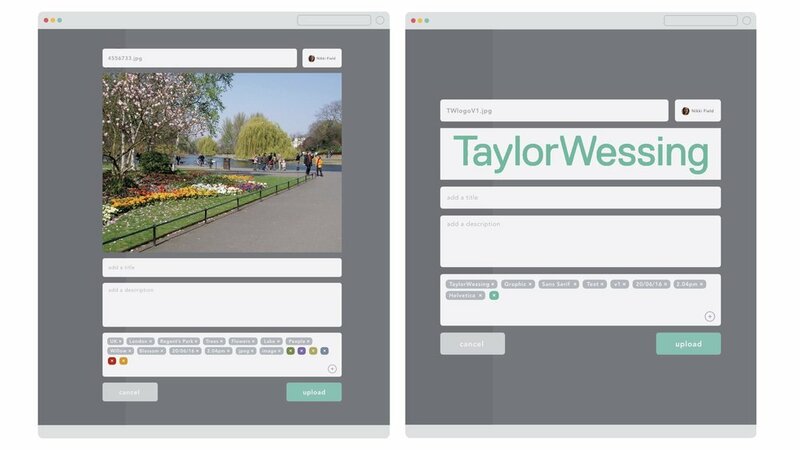 Workshake uses Wolfram Engine to analyse the basic properties of the asset to automatically assign editable meta data to the asset to aid in its retrieval. The user can also add additional meta data, or edit and correct existing meta data. In the case of the image, this analysis includes location tagging, colour extraction, and some basic image recognition to aid in it’s retrieval - is there a tree, it there sky, are there people, is it a portrait. In the case of the graphic, this analysis includes typographic suggestion, file size, letter recognition, colour extraction and file type. The reason this is applied is to expedite retrieval. Often we don’t remember what an image is called or where it is located, only that, “It was a picture in a park I took last year of some flowers”. Workshake allows you to search using these parameters. Here a user has created a document in Workshake to share with their team. As the user types, Workshake analyses the semantics and the imagery being uploaded and applied automatic, editable meta data to aid with its retrieval. The user can also add additional meta data, or edit and correct existing meta data.